CM Magazine: Up All Night. She climbs the stairs to the third floor of the Conservatory. David, the piano teacher, is waiting for her. He teaches in a large studio with his tabby cat, Tripod, and always wears a T-shirt, covered in cat hair, black jeans, and turquoise running shoes. Every few months however, he colours the halo of his hair. Lately it's been green to match his glasses. She missed last week's lesson and he asks her if she is okay. She lies and is uneasy because of it. He asks her for a C-major scale, the easiest scale on the piano, one she has known since she was six, but he asks for four octaves, top to bottom - he's so contrary! - left hand only. She has never played a scale this way before. It throws her. So begins "The Piano Lesson." As the story unfolds, it's not just David's request which throws her, either. The unnamed piano student has a secret to hide - an unwanted ten-week-old fetus. She hasn't practiced for weeks, and her mind is not on the lesson, but, by the end of their hour, she has made a decision which will change her life. The story is the winning entry in Thistledown Press' latest short story competition for established and emerging writers for young adults. Anne Carter's story opens the collection, featuring works by fourteen different writers. Quite different, but equally strong is Brenda Hasiuk's "You Can Call Me Al." Stories set in specific ethnic communities sometimes suffer the paradox of both succeeding and being limited by their context. However, you don't have to be Ukrainian to understand the humour in Hasiuk's account of an unexpected visit from a distant cousin, "someone from Ukraine who knew a song by Paul Simon and didn't want to speak his own language." The subjects of the stories range from class distinctions ("The Way Skin Grows"), an attempted molestation ("Dammed Waters"), a teen mother giving birth ("Dream"), persecuting a new kid at school ("First Snow"), and just what happens when someone finally decides that she's had enough of a family's traditional practical joke ("Norm's Game"). Everyone who has ever had a sibling will understand the desire to kill which is confessed and explored in "Penance," and anyone who has had an accident with the family vehicle will relive the experience in "The Merc and Me." Two stories touch the realms of fantasy: "Snow and Apples" pulls together strands from several traditional fairy tales (not always successfully, I might add), while "The Challenge" melds a real-life test of strength and will with the experiences of the characters in role-playing video games. "The Gift" is unusual in its setting: the time is World War I, and seventeen year-old Bert is shivering in a mud-filled trench in France; he is any homesick adolescent, his situation complicated by absurdities of pain of war. While "The Gift" concludes with an act of generosity; "The Catalyst" begins with one. Alexis, a science whiz, is assigned a new lab partner, a 21-year-old high school drop-out and mother of a toddler. The lab is as unsuited to Rochelle as it is Alexis' ideal environment. Still, when Rochelle stops attending class, Alexis decides to visit and see how she's doing. But, as they sit in Rochelle's run-down, tiny one bedroom apartment, Alexis sees that she cannot be the catalyst for change in Rochelle's life. In the final story, "Dog," homelessness is explored from both a human and a canine point of view. It is a poignant and moving tale, and, although the ending does not surprise the reader, it certainly saddens. 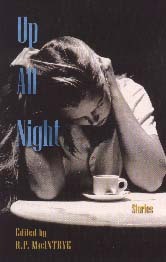 Up All Night is a fine collection for high school readers. Many of the stories are really quite short - often, less than ten pages - making them very manageable reading, and the diversity of the collection offers something for almost every reader. The sexuality in a few of the stories probably makes the collection more suitable for readers in the upper grades of high school, but there's little that's graphic, and the language is largely inoffensive. Thistledown Press has put together excellent short story collections in past years: The Blue Jean Collection (1992), Notes Across the Aisle (1995), Takes: Stories for Young Adults (1996) and Opening Tricks (1998). Up All Night continues the tradition.